Education is a fundamental human right that is recognised as essential for the attainment of all civil, political, economic, social and cultural rights. It was not until 2006, on the adoption of the UN Convention on the Rights of Persons with Disabilities (CRPD), that the right to inclusive education was codified. This volume fills a major gap in the literature on the right of disabled people to education. It examines the theoretical foundations and core content of the right to inclusive education in international human rights law, and explores the various ways of implementing this right through an exploration of legal strategies and mechanisms. 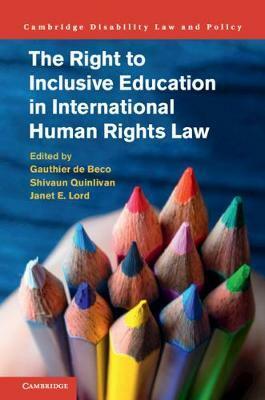 With contributions by leaders in the field, this volume advances scholarship on the core content of the right to inclusive education by examining the content and practice of the right at the national, regional and international levels. Gauthier de Beco is Reader in Human Rights at the University of Huddersfield, and previously taught at the Katholieke Universiteit Leuven, University College London and the University of Leeds. He has widely published in the area of international human rights law, and is on the editorial board of the Revue trimestrielle des droits de l'homme. He has worked as an expert to several international organisations and NGOs. Shivaun Quinlivan lectures in law at National University of Ireland (NUI), Galway. She is a founding member and member of the management committee of the Centre for Disability Law and Policy, NUI Galway. Most recently she has been appointed to the role of Vice Dean for Equality, Diversity and Inclusion in the College of Business, Public Policy and Law. She has worked as a legal expert to several international organisation as well as national and local NGOs with a particular focus on education and equality. Janet E. Lord is a leading authority on international human rights law and the rights of persons with disabilities. She has advised UN agencies, governments, human rights institutions and disability organisations in more than forty countries. She is currently a senior fellow at the Harvard Law School Project on Disability. A scholar as well as a practitioner, she has taught human rights law at universities in Europe, Africa, Asia and the United States.